So... 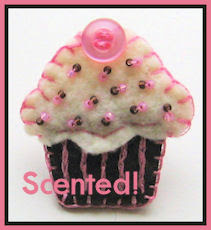 Here is a sweet little cupcake pin from my new line of aromatherapy/scented jewelry. She is just under 2" tall, attached to a silver plated pin back. Made with dark chocolate cake, buttercream icing, and topped with strawberry chocolate sprinkles! Oh! And let's not forget the pretty pink button on top! Scented in Strawberry chocolate buttercream! Yum! Only $10 + shipping. Look for many more scented cupcake pieces, along with some nature and travel inspired aromatherapy/scented pieces in the near future! I was off work today for President's Day. So I've spent most of the day just taking pictures of some new things, uploading some pictures to Flicker, working on my site. It's been a really relaxing day! I've also been putting together some orders for new supplies and... Oh! That reminds me! 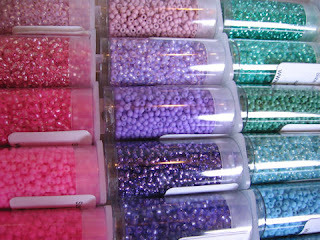 I just got the February 2008 WhimBeads newsletter... And they have bead mixes now! OMG!!! And they are just to die for! 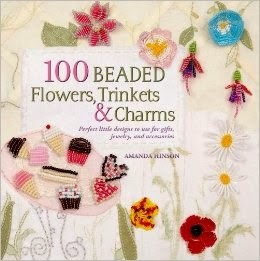 But I just ordered nearly 70 tubes of seed beads last week! Curse you WhimBeads! And you're awesome new bead mixes! lol They do give me an idea for some new jewelries! Hehe... 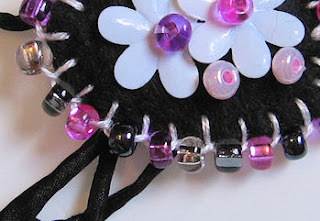 I guess I'm going to be adding a WhimBeads order to my list now! My aromatherapy endeavors are going quite well. I just got a box of goodies in the mail today! Hmm... Well, I better get back to 'work'! The Sweetie will be home from work in a few hours! I hope you guys are having a great Monday as well! Here's a teaser pic of one of my new scented necklaces! This particular necklace is rose scented. 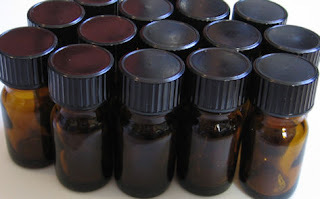 I'll be posting a whole collection of aromatherapy/scented necklaces and jewelry in the next few months. So keep visiting to see more, and find out how you can get your own aromatherapy jewelry! I just love getting mail like this! 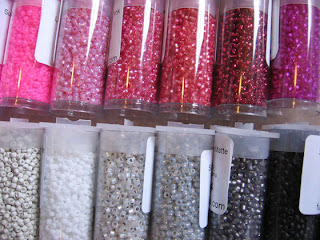 I ordered 67 tubes of 11/0 seed beads (all different colors, too!) last week, and they finally arrived today! Yippy! 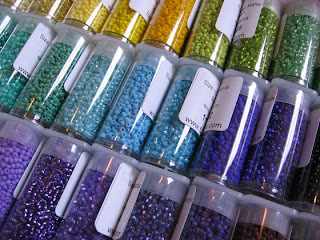 I needed lots and lots of seed beads for some new bead embroidery projects that I've been planning. Don't they look so pretty?? Now I am one step closer to having some beautiful beaded butterflies, cupcakes, and hearts up for sale! I've been so busy working on Valentine orders the past couple of weeks, that I've totally been neglecting my new blogs. Shame on me! Now that the Valentine crunch is over, I can hopefully update more often, add more pictures of my work, and share my stories and plans with you all! And, while on the subject of butterflies... Spring is just around the corner; I can tell. It's so blustery and warm outside. Butterflies always remind me of spring, since spring is actually a time when things are ever changing. New and renewed life... I've never looked so forward to spring! I hope you will follow me on this wonderful journey!